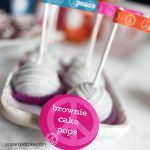 New Party: Peace, Love and PARTY! Wondering how you will decorate for that upcoming Valentine’s party you are throwing? Needing a trend setting printable set for your daughter’s ninth birthday sleepover? Don’t worry… your search is over!